In the chapter And No Birds Sing, Rachel Carson describes the consequences of DDT spraying (for elm bark beetles) for various bird populations in the Midwestern US. Two ornithologists at Michigan State University, George Wallace and John Mehner, documented the effects on American Robins on the East Lansing campus, where 370 adult robins were counted in 1954, before spraying began. By the end of June 1957, when approximately 300 young robins should have been foraging on the grounds of MSU, only one was reported. Carson listed multiple studies and observations that documented the toxicity of DDT, accumulating in insects, earthworms, and freshwater crustaceans, for avian and mammalian species. Foliar spraying of elm trees devastated many insectivorous bird populations, including warblers, gnatcatchers, and kinglets. Below you’ll see altered book pages, in which I’ve painted over most of the text (it was a chapter about White-throated Sparrows, which apparently didn’t arouse the gun-crazy tendencies of the author). I added a quote from Silent Spring about warblers, and included a couple of little drawings of Yellow Warblers and Cape May Warblers. More when I return from reviewing grant proposals …. 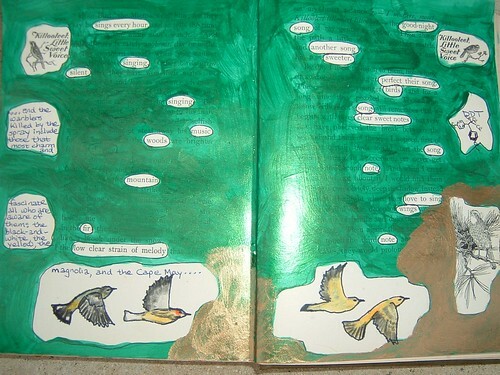 This entry was posted in art journals and tagged DDT, Silent_Spring, warblers. Bookmark the permalink. Hi Kristi so long I hope you are well. It is interesting what you mention in your blog. Now that it’s been a while have recovered these bird populations, or has been declining?